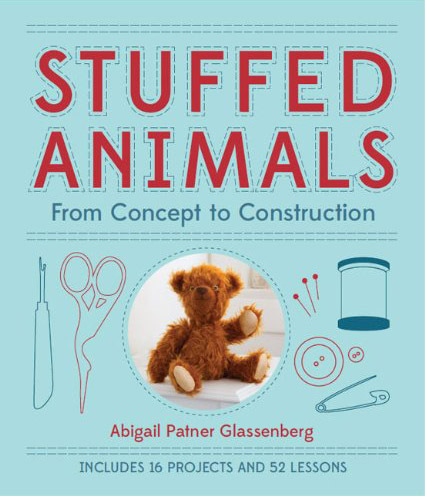 How much is a sewing pattern for a stuffed animal worth? When I sell a single sewing pattern to a big company, such as a book or magazine publisher, or to one of the big pattern companies like Simplicity, I can generally expect to get $250 for that pattern. 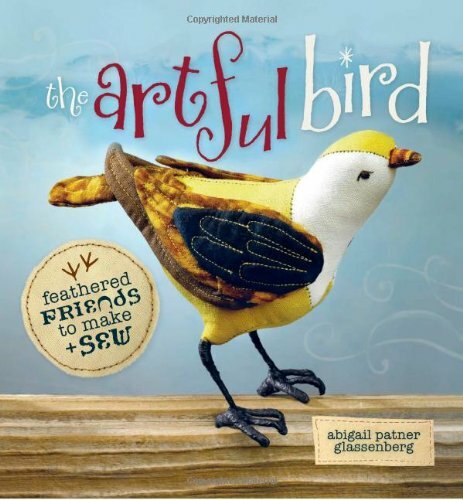 Then, six months or a year later, the pattern will be published and hit bookstores or newsstands or craft stores. No further money comes in. With the big pattern companies the contract spells out royalties you could earn after making up the $250 advance (at a tiny fraction of the wholesale price), but in all honesty a pattern isn’t likely to make enough to earn back the advance. So really it’s $250 and that’s it. 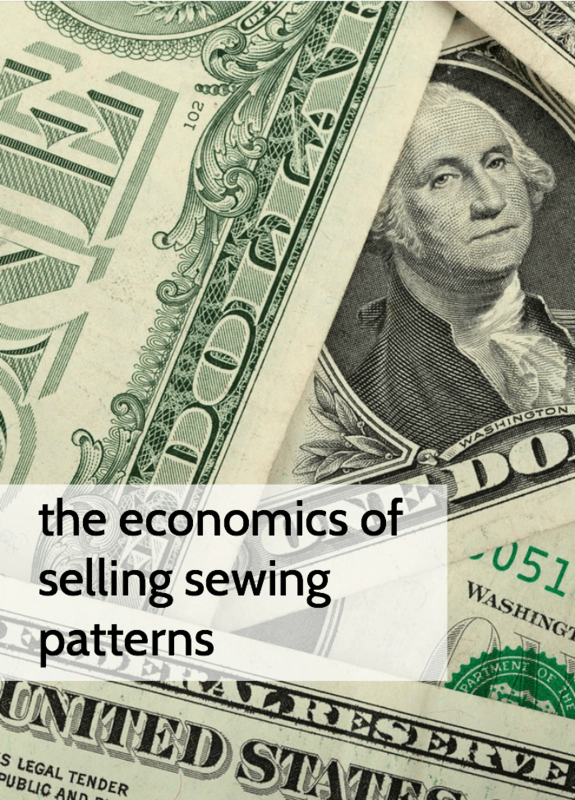 When I sell a sewing pattern myself, as a PDF download at a reasonable price ($9 per pattern), it takes about two months on average to sell 28 copies or the equivalent of $250. What’s the difference? It’s $250 either way, right? The difference is that I can sell my PDF pattern forever. The tail is infinitely long. I could very well make $250 every two months all year from that pattern for an annual total of $1,500. In two years that’s $3,000 for just one pattern. You get the picture. Okay, that’s nice. But then you’re never published. Being published exposes you to a new audience and lends your design portfolio a nice big stamp of approval. So here’s the best thing, the way to really make the most financially from a project: make a project do double duty. Let’s take a craft magazine as an example. Following the submission guidelines on the magazine’s website, usually a theme and color scheme, create a project and submit it. Once it’s accepted ask about the terms of the contract. You want to be sure the copyright reverts back to you either on the magazine’s publication date, or shortly thereafter. Once the magazine is out, go ahead and sell the pattern a la carte in your online shop. Now you’ve got a cash infusion upfront for this pattern, plus the cache of having it chosen for publication, and then the infinitely long tail of earnings with no middle man. Even better, find out if you can get your sample back. If so, have a sample sale and sell that, too. The more doubling up, or tripling up, you can do, the more financially successful your business will be. Once you become a designer you should begin to think of how every project might do double duty. 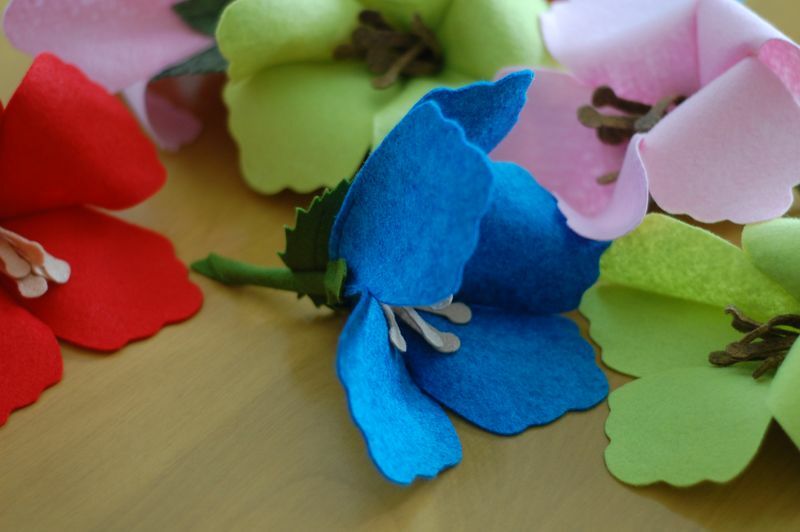 Last year I designed and made felt hibiscus flowers for National Nonwoven’s booth at Spring Quilt Market and then sold the pattern to a publisher to be included in a book. This makes it worth my time. National Nonwovens gave me the felt, nearly $100 in materials, and the publishing company paid me for the pattern. This is the way to make it work. I’m not kidding you. It takes many, many hours to create a stellar sewing pattern and it’s very hard to make a living as a crafter. Double duty is one of my best tricks and I hope it helps you, too. Like this post? Subscribe to my newsletter for more helpful information delivered right to your inbox once a month: sign me up! someone wise told me this very same thing once…never can have too many reminders! I elect you queen of the crafters!! devious. 🙂 I love it. Thank you, but I don't think it's devious. It's totally honest. In order to make a living you have to make each design count. I think that's totally okay. In Australia it is most common that you sell a pattern to a magazine ( $250.00) and then copyright reverts to you a few months after publication of the magazine. Given that you have to submit so early, it is usually almost a year between finished product and the time you can sell the pattern. I agree double duty is the way to go. Is it common for magazines to want digital copyright as well to allow downloads? it is sometimes written into the contracts here but can be a case by case thing. 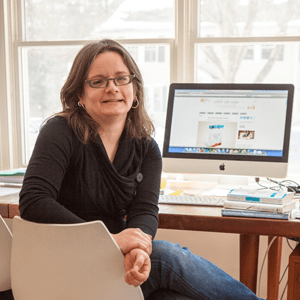 Another benefit to selling your own patterns (over a magazine) is that when a person buys a pattern from you… they’re coming to your site, which means you’re potentially building a customer relation. When people make a pattern from a magazine, there’s no necessary relation between them and the designer. So, while it’s hard to calculate, my bet is that even $250 in sales on your site yield many more ‘returns’ in the future. You bring up such an important point. Nothing can replace the value of buying directly from the maker. You build a business one relationship at a time, especially an online business. If it has to be a choice between selling the pattern to magazine or selling it yourself (like if the magazine retains the copyright even after publication) I'd sell it myself. The earning potential is higher in the long term and the opportunity for developing an ongoing relationship with the customer is much, much higher. I was curious what the pattern companies/magazines/books pay, because i assumed it was not very much. I was approached to submit designs for a book editor to maybe, possibly accept and they couldn’t tell me how much I would be paid if they were. Huh? But on the other hand, how else does one get to be on the list of people always invited to be in these blog hops, etc? My biggest dilemma is in pricing my patterns. People expect the $6-10 range. My last four patterns each had at least 6+ weeks of full time design, photography, and actual writing. My lastest bag pattern has 100+ photos on 30+ pages of instructions and 17 pages of digitized, fully tested pattern pieces. Yet I still felt like I was pushing it at $12. Maybe it’s just my imagination that I feel like people expect <$10 PDF patterns? Since you brought up the topic, I'm just curious what you think. Which company are you referring to, Misty? Thank you again for providing information on the business side of crafting and sewing. I was curious if you also sold individual patterns to shops and quilting stores? For example, my friend’s cousin, Marcia Layton Designs, creates small quilt patterns and wholesales them to shops plus sells them as PDFs on-line. I believe she is about to get into Joann’s Fabrics. 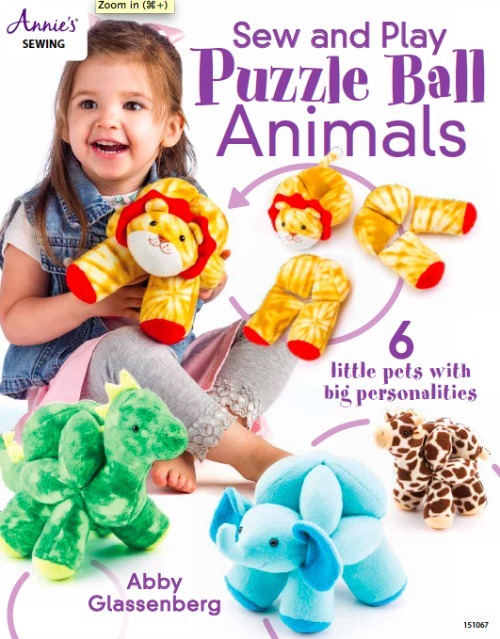 I always check the individual patterns and have seen soft toy patterns in the same sections. Also, have you considered gaining a corporate sponsor? Marcia uses Clover yo-yo makers in her designs so she sent them a sample of her quilts and they now include her patterns in their trade shows. Thanks again – I always enjoy visiting your site. I have an idea for you. Check out the Anise pattern from Colette patterns (http://www.colettepatterns.com/). And then take a look at the Anise Companion. Colette has an interesting idea here. Essentially you can purchase the pattern with detailed instructions for $12. Then, you can add on the companion ebook that goes into depth, with step-by-step photos and many more details, for an additional $9. If you're an experiences sewist you'll be fine with just the pattern, but if you are tackling this project with some worry that you might not have the skills yet, getting the Companion would be well worth your money. I'm not sure how sales have been for Colette on this product, but it's a model worth considering for sure. I don't sell print patterns at all. Producing print patterns and working with a distributor to get them into stores nationwide is a whole other area of this business. I did a phone interviewed BariJ, an expert on this topic who has been creating print patterns for many year. You can hear our conversation here if you're interested: http://whileshenaps.typepad.com/whileshenaps/2012/03/softies-for-sale-series-selling-printed-patterns-through-wholesale-distributors.html It's not something I'm planning to explore, at least not now. Without print patterns to sell it doesn't make financial sense to attend a trade show. I think it is still a case by case situation here, too. I just had a project accepted into a magazine last week and they are not asking for any digital rights. I have found selling to magazines and then turning it into a digital pattern later works really well for me. Like you say – double duty. I think it is just the smart way to work. Thanks so much for this terrific post. I already knew this, but I’ve yet to put it into action! I’ve been killing myself by producing patterns for magazines and then other patterns specifically for my online shop. Silly me! Time to get my ducks in a row. Thanks for the little push in the right direction. Have a super day! how to you get the pattern produced on paper, or pdf format professionally, because this is a route i want to take with my clothing line, but i haven’t got a clue, where to start. 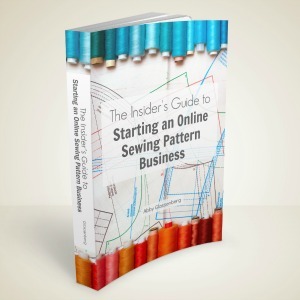 You might like my ebook, The Insider’s Guide to Starting an Online Sewing Pattern Business. Hi, I love your post! I just recently been contacted by simplicity for my designs and I really don’t know what to do . 🙂 Should I just make my own patterns and sell them? I was super excited when simplicity contacted me and I realize now that I could make more money by selling my own patterns, but with simplicity it would be very good exposure. I’m really confused on which direction I should take my business. Do you have any thoughts? Hi Julee, If you’d like to email me at abbyglassenberg at comcast dot net I’d be happy to talk it over with you.